The Fit hybrid has new features to differentiate it from the current version including revised headlights clear rear lights a new front grille restyled bumpers and a chrome tailgate. TOKYO -- Honda Motor Co. is not planning to bring the hybrid version of its Fit small car to North America -- for now -- amid doubts drivers will pay more for its gasoline-electric drivetrain. The hybrid Fit went on sale in Japan today and will go to Europe early next year. But Executive Vice President Koichi Kondo said the Japanese carmaker has held off making a decision on a U.S. debut, partly because gasoline prices there haven't risen as quickly as expected. Honda has wrestled with a fickle U.S. market for hybrid vehicles. While the Toyota Prius has racked up healthy sales, Honda's offerings such as the Insight and CR-Z sporty hybrid have missed expectations. Cheaper prices at the gasoline pump are one reason U.S. drivers are leery about paying more for the hybrid technology, even if it means better fuel efficiency. Fit Chief Engineer Kohei Hitomi said Americans used to big cars probably aren't willing to pay the hybrid premium for marginal mileage gains in a compact vehicle. In Japan, the hybrid Fit starts at 1.59 million yen ($19,275), about 29 percent more than the re-styled gasoline-only version. It delivers 70 mpg under Japan's testing cycle, compared with the non-hybrid's 57. 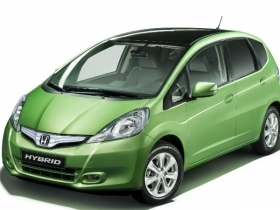 Honda aims to sell about 14,000 Fits a month in Japan, hybrids and nonhybrids combined. The gasoline-electric version is expected to account for 40 percent of total volume here.